Kim Yong Market - It’s a traditional foodie place and shopaholic heaven. Go on a foodie hunt at this popular spot, and taste what Thailand has to offer! Filled with cultural knick knacks and art and textiles to buy, you’ll really want to take your time. Plus, there are many local brands here so you’ll come away with tons of bargain buys. Psst! Their chestnuts are delicious and cheap! 250 baht for 1kg? It’s a total steal. And don’t forget to try their grilled potatoes with coconut milk. Odean Shopping Mall - This is where you can get cheap and good quality Wacoal lingerie, and it’s filled to the brim with beautifully designed cheap wares. Try some home-grown brands you’ve never seen before and remember that there’s a night market outside the mall if you’re interested. Wine Village - The latest gorgeous attraction you have to visit! Looking really scenic with its European architecture, there’s even a magical carousel, pumpkin carriage and castle to add to the ambiance. 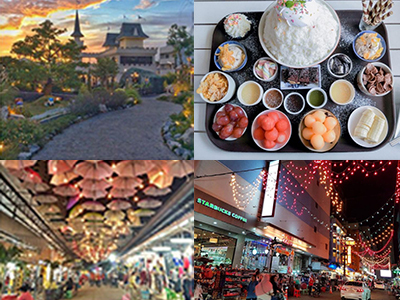 Here you’ll be able to feed sheep, goats, bunnies and parrots, go shopping at their night bazaar, and indulge in yummy food at various Thai/Western restaurants located in the village – where you’ll get to dine on the rooftop. Take your pick! Asean Night Bazaar Hatyai - Fill up that suitcase and pack up some cultural experiences too. A market that’s only closed on Mondays that has everything weekend markets are known for – art, fairy lights and rows upon rows of stalls. Of course, you don’t want to miss out buying some matchy and comfortable tees for cheap! Happy Dessert Factory - Take a sweet tooth break with cotton candy and fruits. Shaved ice is everyone’s thing, but you can dress it up to your fancy. If you’re craving for a solid meal, you can also try something off their savory menu. The Lotus Bowl/Bua Loy Mae Luean (บัวลอยหน้าธิดา) - There’s always room for dessert, especially for local specialities. Popular with the locals, this is something that can’t be missed. They have many choices, and they all look good. One way to try them all, is to have each friend order a different one and share. But the vermicelli in coconut milk is a definite must.